Hey everyone! It’s been a while since I have posted something up on my blog. I took a break for a while as I didn’t have much time to blog. I am so glad I am back! I hope you all had an awesome Thanksgiving! 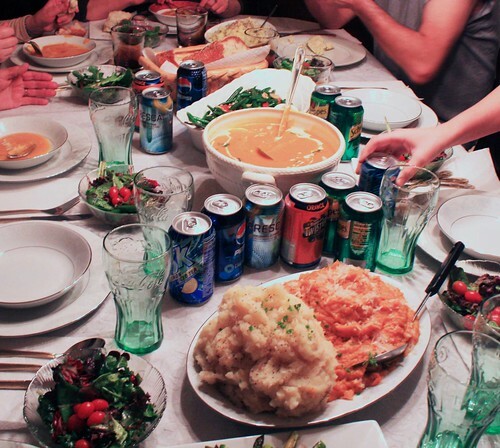 My Thanksgiving was very enjoying. 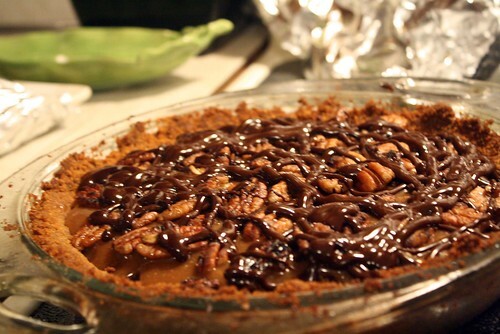 I basically spent the whole month of November thinking about Thanksgivng and testing recipes for the big day. When it all happened it was very fun! I cooked and baked everything expect the turkey that the rest of my family had. It was really fun cooking all day. I just cooked and baked for two days straight!! 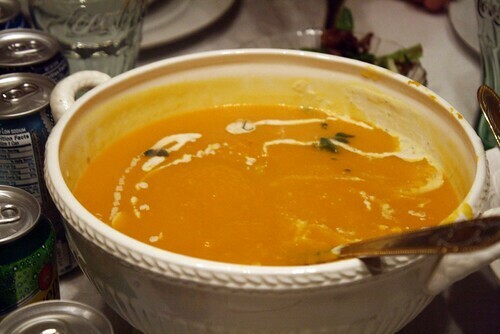 Here is what I made for Thanksgivng: We started out with a tasty Butternut Squash Soup with Sage Cream. We also had a nice salad of fresh baby greens. Then we had some very awesome sides like Mashed Parsnips and Potatoes, Coconut Mashed Sweet Potatoes, Cornbread Stuffing from the PPK, Roasted Asparagus with Balsamic Vinegar and Sauteed Green Beans with Cherry Tomatoes. 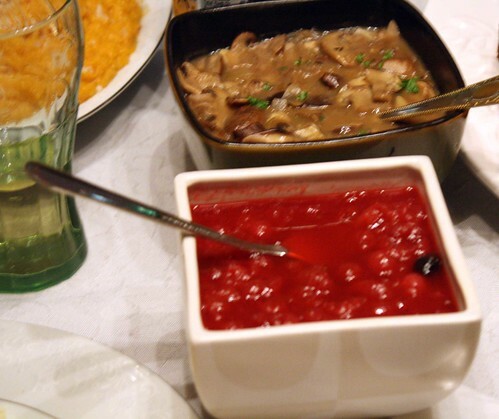 I also made Mushroom Gravy from V’con and Cranberry Sauce also from V’con. 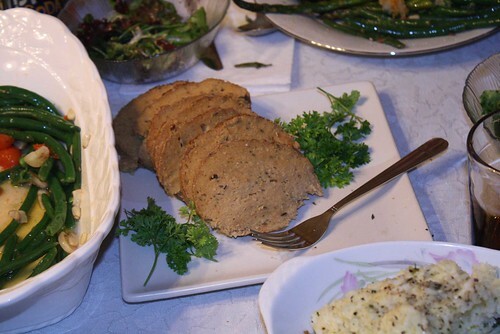 The main course that I made was an awesome Vegan Roast. The Roast was very good and I was happy that many tried it!! For the Roast I took Bryanna’s recipe and Vegan Dad’s recipe and give it my own twist. I will be posting the recipe tomorrow. My mom and I also made Spinach Pie A.K.A Spanokipita. I wanted to make some Acorn Squash but we ran out of time! For desert we had Smlove Pie from V’con which was amazing! We also had Pumpkin Pie and Apple Pie. The best part was all the complements I received from everyone! Here are some pictures! Some of the pictures may not be top quality has I was kind of in a rush taking them. Not everything is pictured. 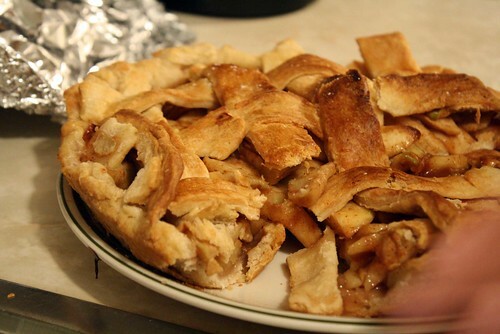 Apple Pie, I had to take it out of the pie pan so I can make the Smlove pie, so it kinda fell apart.